Purpose: The effect of hypothyroidism on the choroidal thickness (CT) was investigated in patients with subclinical hypothyroidism and overt hypothyroidism, and biochemically and clinically euthyroid patients receiving levothyroxine treatment. The patients were compared with healthy subjects. Materials and Methods: One eye of 71 hypothyroid and 22 healthy subjects between 20 and 40 years of age were included in this study. CT measurements were taken at the fovea and at 2 points that were 1500 μm nasal and temporal to the fovea using spectral-domain optical coherence tomography. Independent sample t-test's and was used for statistical analysis of the data. Results: The CT was significantly thicker in hypothyroid patients compared to healthy subjects (P values were 0.013 for subfoveal, 0.015 for temporal and 0.020 for nasal segments). The intraocular pressure (IOP) and body mass index (BMI) were also significantly higher in hypothyroid patients (P values were 0.021 and 0.003, respectively). There was not a statistically significant difference in the BMI and IOP measurements between healthy subjects and euthyroid patients (P > 0.05). However, there was a statistically significant difference in the subfoveal, temporal and nasal CT measurements between healthy subjects and euthyroid patients (P values were 0.006, 0.031 and 0.013, respectively). Conclusions: All subgroups of hypothyroid patients had thicker CT compared to healthy subjects. Euthyroid patients receiving levothyroxine treatment had lower IOP, BMI levels, and serum lipid levels than patients with subclinical hypothyroidism and overt hypothyroidism. Hypothyroidism is characterized by a decrease in thyroid hormone production by the thyroid gland. It ranges in severity from mild subclinical to overt hypothyroidism. Subclinical hypothyroidism is characterized by serum thyroid hormone concentrations (free tetraiodothyronine [FT4] and free triiodothyronine [FT3]) within the laboratory reference range and an increase in serum thyroid-stimulating hormone (TSH) levels, which simply reflects the pituitary adaptation to maintain thyroid hormone levels. Hypothyroidism impairs serum lipid regulation and is known to contribute to the progression of atherosclerotic vascular diseases. The cardiovascular system is one of the major targets for thyroid hormone action and is vulnerable to the effects of thyroid hormone deficiency even in individuals with mild thyroid failure. Given the vascular nature of the choroid, it is expected that the choroidal thickness (CT) undergoes changes as a result of hypothyroidism. Further investigation of CT under the influence of different systemic conditions like hypothyroidism is needed. The current study was designed to investigate the effects of the hypothyroidism on the CT. This cross-sectional study was conducted in one eye of healthy and hypothyroid age-matched women: 22 healthy subjects, 24 subclinical hypothyroid (SCH) patients, 23 overt hypothyroid (OVH) patients and 24 euthyroid hypothyroid patients receiving levothyroxine treatment were examined between December 2012 and June 2014. This study was performed in adherence with the tenets of the Declaration of Helsinki and was approved by the University review board (Number: 2012/132). Informed consent was obtained from all of the study participants. The inclusion criteria were as follows: 20-40 years of age; <5-dimensional of spherical and <3-dimensional of cylindrical refractive error; best-corrected visual acuity of 20/20 or better; no history of chronic ocular disease, such as glaucoma and uveitis; no systemic disease in the healthy subjects; and no systemic disease other than hypothyroidism in the hypothyroid patients. The exclusion criteria were as follows: The presence of an ocular disease that would prevent the examination of the corneal and retinal states, prior application of laser or any ocular surgery; a history of smoking or alcohol consumption; a history of any medication use within the previous 3 months, including hormonal therapy (except for levothyroxine treatment) or systemic vasoactive drugs. We included a subject's left eye, only if their right eye did not meet the inclusion criteria. Serum levels of free T3 (FT3), FT4, TSH, anti-thyroid peroxidase antibody and thyroglobulin antibody levels were determined using an electrochemiluminescence immunoassay method with a fully automated immunoanalyzer according to the manufacturer's instructions (Cobas e 601, Roche Diagnostics, Mannheim, Germany). Serum triglyceride (TG), total cholesterol (TC), low-density lipoprotein (LDL) and high-density lipoprotein (HDL) levels were quantified using an autoanalyzer according to the manufacturer's instructions (Architect C8000, Abbott Laboratories, Illinois, USA). A detailed ophthalmologic examination, including best-corrected visual acuity, intraocular pressure (IOP), central corneal thickness (CCT) and retinal and CTs, was performed. IOP and CCT were measured using Goldmann applanation tonometry and an ultrasonic pachymeter (Nidek UP-1000 [Nidek Co., Ltd., Aichi, Japan]), respectively. We also calculated the CCT adjusted IOP value. The axial length was measured using an ultrasonic biometer (Nidek Echo Scan-3300 [Nidek Co., Ltd., Aichi, Japan]). Following the other ophthalmologic examinations, the retinal and CTs were measured using a Spectralis SDOCT system (Heidelberg Engineering, Heidelberg, Germany). The ophthalmologic examinations were performed during the morning hours (between 10:00 am and 12:00 am). All of the SDOCT scans and measurements were acquired by the same experienced operator (FU) with the Spectralis SDOCT system (software version 5.3) using the horizontal 30° line scan EDI mode through the fovea. Using an automatic real-time (ART) imaging value of 100 and the active eye-tracking feature, the line scan images were saved for analysis after 100 frames were averaged. The retinal thickness was measured using the automatic segmentation values provided by the Spectralis SDOCT system. The CT was measured manually from the outer portion of the hyperreflective line, corresponding to the retinal pigment epithelium, to the inner surface of the sclera [Figure 1]. Using the manual calipers provided by the SDOCT software, two experienced operators (FU and ÜD) measured the CT at 100% magnification and fine corrections were performed at 200% magnification. The EDI images for each subject was opened by another operator (AK), and CT measurements were performed by masked readers (FU and ÜD) on different sessions. For intraobserver reproducibility, FU performed 2 CT measurements and for interobserver reproducibility, ÜD performed 1 CT measurement. SDOCT scans were acquired without pupil dilation. Only images with an imaging quality score of >20 were studied. The retinal and CTs were measured at the central fovea and at 1500 μm nasal and 1500 μm temporal from the center of the fovea. The default RNFL optic disc protocol was used to measure RNFL thickness, which consisted of a 3.6 mm diameter circle scan for RNFL analysis, an ART imaging value of 100 and the active eye-tracking feature. RNFL thickness was measured using the automatic segmentation values provided by the Spectralis SDOCT system. The demographic and clinical characteristics of the study sample and their statistical significances are shown in [Table 1]. Thyroid hormone levels and serum lipid levels are presented in [Table 2]. SCH patients were newly diagnosed patients who had no previous history of any systemic disease. Euthyroid patients were biochemically and clinically euthyroid for at least 1-year, and they had 4.0 ± 2.81 years of hypothyroidism diagnosis (range: 2-12 years). In the OVH group, 9 patients were newly diagnosed and 14 patients had a history of levothyroxine treatment and discontinued treatment for at least 6 months (mean duration 3.58 ± 1.83 years, range: 1-8 years). The etiology of hypothyroidism was Hashimoto's thyroiditis (49 patients, 69.01%) and idiopathic (22 patients, 30.99%). None of the hypothyroidism patients had thyroid orbitopathy. This study included 86 right and 7 left eyes of subjects (the right eyes of five subjects were excluded due to high myopic astigmatism and the right eye of two subjects were excluded due to high myopia). Independent sample t-test's revealed a statistically significant difference in the body mass index (BMI), CCT adjusted IOP, CCT nonadjusted IOP, serum TG level and subfoveal, temporal and nasal CT measurements between healthy subjects and all groups of hypothyroid patients (P values were 0.003, 0.016, 0.021, 0.023, 0.013, 0.015 and 0.020, respectively) [Table 1]. However, there was not a significant difference in age, spherical equivalent, CCT, ocular axial length, retinal thickness, RNFL, serum TC, LDL and HDL levels between healthy subjects and all groups of hypothyroid patients (P values ranged between 0.069 and 0.813) [Table 1]. There was not a statistically significant difference in the BMI, CCT adjusted IOP, CCT nonadjusted IOP and serum TG levels between healthy subjects and euthyroid patients (P values were 0.117, 0.208, 0.099 and 0.688, respectively). However, there was a statistically significant difference in the subfoveal, temporal and nasal CT measurements between healthy subjects and euthyroid patients (P values were 0.006, 0.031 and 0.013, respectively). Independent sample t-tests did not reveal a statistically significant difference in the BMI, CCT adjusted IOP, CCT nonadjusted IOP measurements and subfoveal, temporal and nasal CT measurements of the euthyroid patients and the group of overt and SCH patients (P values were 0.165, 0.114, 0.460, 0.235, 0.625 and 0.343, respectively). Serum TG levels were significantly lower in euthyroid patients (P = 0.005). Serum TC and LDL levels were also lower in euthyroid patients, but it was not statistically significant (P values were 0.091 and 0.244, respectively). There was a statistically significant difference in BMI, CCT adjusted IOP measurements, CCT nonadjusted IOP measurements, subfoveal, temporal and nasal CT measurements between healthy subjects and the group of overt and SCH patients (P values were <0.001, 0.006, 0.015, 0.041, 0.020 and 0.045, respectively). Serum TG and HDL levels were significantly different (P values were <0.001 and 0.013, respectively), but the difference in serum TC and LDL levels was not significantly different (P values were 0.175 and 0.053, respectively). The choroid in SCH patients, OVH patients and euthyroid patients demonstrated a wider range of thicknesses and higher SDs (range of subfoveal CT and SDs, 261.0-546.0 and 88.48; 275.5-520.0 and 79.50; and 243.0-570.0 and 80.25 μm, respectively) than healthy subjects (235.0-478.0 and 71.52 μm) [Table 1]. The study revealed that CT can be measured using SDOCT and that thicker CT exists in all subgroups of hypothyroid patients than healthy subjects [Figure 1]. Intraobserver and interobserver differences in subfoveal CT measurements are summarized in [Table 3]. No statistically significant difference was found between the measurements taken by the two operators (FU and ÜD). The CR ranged between 19.86 and 20.52 μm for intraobserver measurements and 22.03 and 27.29 μm for interobserver measurements [Table 3]. In the current study, we found that spherical equivalent, CCT, retinal thickness and RNFL thickness did not significantly differ between healthy subjects and hypothyroid patients. However, CT, IOP, BMI and serum lipids were increased in hypothyroid patients. CT was thicker in all subgroups of hypothyroid patients including patients, who were euthyroid for at least 1-year. To the best of our knowledge, this is the first study to demonstrate the effects of hypothyroidism on CT. There have been conflicting reports on the relationship between subfoveal CT and age. Fujiwara et al. reported that the CT in subjects younger than 10 years old was significantly thicker compared to other age groups, remained unchanged from 10 to 20 years of age, but then decreased gradually after age 30. However, in another study, it was reported that the subfoveal CT had no correlation with age in subjects younger than 60 years of age. In this study, subjects aged 20-40 years old were recruited, and a correlation was observed between age and CT. There was a positive correlation between age and CT, which might be due to the duration of hypothyroidism. Previous studies on the mean subfoveal CT in healthy subjects reported a range from 241 to 372 μm. ,,, The mean subfoveal CT observed in the current study, which included only healthy subjects and hypothyroid patients 20-40 years of age, was 370 and 419 μm, respectively. The thicker subfoveal CT of healthy subjects in the current study is attributed to the inclusion of younger subjects with lower refractive error. Differences in the CT are not only due to pathological (polypoidal choroidal vasculopathy , and central serous chorioretinopathy  ) and pharmaceutical (intravitreal ranibizumab  ) factors but also to age, , axial length, , refractive status, , diurnal rhythm,  and the presence of hypothyroidism as shown here. The factors that most affect the subfoveal CT are still unknown. In the current homogenous study group, hypothyroidism appeared to affect CT significantly. It is plausible that the production of glycosaminoglycans and the accumulation of connective tissue matrix, which is characteristic of hypothyroidism, can lead to increase in the CT. Wittman reported increased interstitial connective tissue in hypothyroidism patients in a postmortem autopsy study. There are also studies that emphasize the presence of increased capillary density in hypothyroid animals. , This result may be due to an increased production of angiogenic factors. Similarly, in hypothyroid rats, increased capillary density may result from increased renal levels of angiogenic factors, namely angiogenin and basic fibroblast growth factor. It was observed that an increase in capillary density remained even after thyroid hormone replacement. It was reported that inhibition of glycosaminoglycan accumulation by thyroid hormone is most likely due to a decrease in glycosaminoglycan synthesis rather than glycosaminoglycan degradation. These studies support our results that report increased CT in all subgroups of hypothyroid patients including euthyroid patients. In the current study, despite euthyroid patients and healthy subjects having similar levels of IOP, BMI and serum lipid levels, the CT was still significantly thicker in this subgroup. The thyroid hormones regulate cholesterol and lipoprotein metabolism, and hypothyroidism is known to alter the lipid profile. Wong et al. reported that the subfoveal CT was found to be significantly higher in subjects with hypercholesterolemia. Diabetic and hypertensive patients were excluded in this study, but the thyroid hormone levels of included subjects were not reported. Salazar et al. reported that the choroid thickness increased in hypercholesterolemic rabbits, and the change was not completely reversible upon normalization of the serum cholesterol. The current study is the first to report that hypothyroidism may result in choroidal thickening due to probable changes in the interstitial connective tissue matrix, increased capillary density and/or increased serum lipid levels. Thickening of the choroid was not reversed with thyroid replacement therapy, even after at least 1-year of maintenance of the euthyroid state, despite the decreased levels of TG, TC, and LDL in the euthyroid patients. A study comparing the CT of hyperlipidemic subjects with and without hypothyroidism is needed to interpret the effect of hyperlipidemia and hypothyroidism on the choroid. A correlation between primary open angle glaucoma and hypothyroidism has been reported in some studies, and thyroid replacement therapy may have a protective role by decreasing IOP. ,, Despite being within normal limits, this study revealed that hypothyroid patients had a significantly higher IOP compared to healthy subjects. We found that the IOP levels were significantly higher in the subclinical and OVH patients compared to euthyroid patients and healthy subjects. There were some limitations to this study, such as the cross-sectional study design. Our sample size was limited; however, a significant change was observed in the CT between hypothyroid patients and healthy subjects. We included young Turkish women who did not have prior use of any systemic medication other than levothyroxine. We obtained CT measurements manually because no software algorithm is currently available for choroidal segmentation. We set the calipers at 100% magnification because caliper placement can vary depending on the magnification of the scan; for instance, low magnification (below 100%) can result in improper caliper placement and very high magnification (above 200%) can decrease the image resolution, leading to indistinct borders. In summary, this study demonstrated that hypothyroidism caused an increase in the CT, IOP, BMI and impaired serum lipid levels. Euthyroid patients receiving levothyroxine treatment had lower IOP, BMI levels, and serum lipid levels than patients with subclinical hypothyroidism and overt hypothyroidism, but the CT was thicker in all subgroups of hypothyroid patients compared to the healthy subjects. Further prospective studies with larger sample sizes are needed to determine the possible effects of hypothyroidism on the choroid. These data highlight the importance of thyroid hormone status and increase the relevance of the interpretation of the SDOCT results. Smith TJ, Bahn RS, Gorman CA. Connective tissue, glycosaminoglycans, and diseases of the thyroid. Endocr Rev 1989;10:366-91. Smith KD, Arthurs BP, Saheb N. An association between hypothyroidism and primary open-angle glaucoma. Ophthalmology 1993;100:1580-4. Lin HC, Kang JH, Jiang YD, Ho JD. Hypothyroidism and the risk of developing open-angle glaucoma: A five-year population-based follow-up study. Ophthalmology 2010;117:1960-6. Motsko SP, Jones JK. Is there an association between hypothyroidism and open-angle glaucoma in an elderly population? An epidemiologic study. Ophthalmology 2008;115:1581-4. Muñoz-Negrete FJ, Rebolleda G, Almodóvar F, Díaz B, Varela C. Hypothyroidism and primary open-angle glaucoma. Ophthalmologica 2000;214:347-9. Richardson J, Walsh M. Uveal effusion as a sign of myxoedema. Br J Ophthalmol 1969;53:557-60. Ozturk BT, Kerimoglu H, Dikbas O, Pekel H, Gonen MS. Ocular changes in primary hypothyroidism. BMC Res Notes 2009;2:266. Cappola AR, Ladenson PW. Hypothyroidism and atherosclerosis. J Clin Endocrinol Metab 2003;88:2438-44. Spaide RF, Koizumi H, Pozzoni MC. Enhanced depth imaging spectral-domain optical coherence tomography. Am J Ophthalmol 2008;146:496-500. Sogawa K, Nagaoka T, Takahashi A, Tanano I, Tani T, Ishibazawa A, et al. Relationship between choroidal thickness and choroidal circulation in healthy young subjects. Am J Ophthalmol 2012;153:1129-32.e1. Fujiwara A, Shiragami C, Shirakata Y, Manabe S, Izumibata S, Shiraga F. Enhanced depth imaging spectral-domain optical coherence tomography of subfoveal choroidal thickness in normal Japanese eyes. Jpn J Ophthalmol 2012;56:230-5. Wong IY, Wong RL, Zhao P, Lai WW. Choroidal thickness in relation to hypercholesterolemia on enhanced depth imaging optical coherence tomography. Retina 2013;33:423-8. Xu J, Xu L, Du KF, Shao L, Chen CX, Zhou JQ, et al. 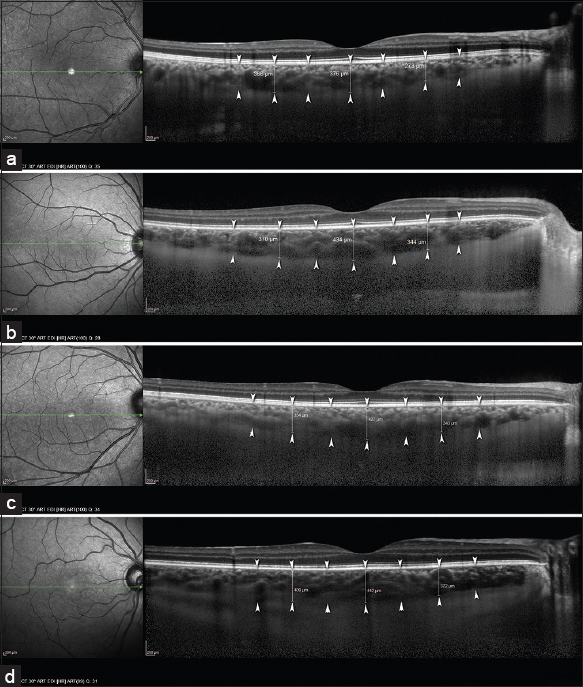 Subfoveal choroidal thickness in diabetes and diabetic retinopathy. Ophthalmology 2013;120:2023-8. Shah S, Chatterjee A, Mathai M, Kelly SP, Kwartz J, Henson D, et al. Relationship between corneal thickness and measured intraocular pressure in a general ophthalmology clinic. Ophthalmology 1999;106:2154-60. Bland JM, Altman DG. Measurement error. BMJ 1996;313:744. Tan CS, Ouyang Y, Ruiz H, Sadda SR. Diurnal variation of choroidal thickness in normal, healthy subjects measured by spectral domain optical coherence tomography. Invest Ophthalmol Vis Sci 2012;53:261-6. Koizumi H, Yamagishi T, Yamazaki T, Kawasaki R, Kinoshita S. Subfoveal choroidal thickness in typical age-related macular degeneration and polypoidal choroidal vasculopathy. Graefes Arch Clin Exp Ophthalmol 2011;249:1123-8. Imamura Y, Fujiwara T, Margolis R, Spaide RF. Enhanced depth imaging optical coherence tomography of the choroid in central serous chorioretinopathy. Retina 2009;29:1469-73. Yamazaki T, Koizumi H, Yamagishi T, Kinoshita S. Subfoveal choroidal thickness after ranibizumab therapy for neovascular age-related macular degeneration: 12-month results. Ophthalmology 2012;119:1621-7. Savinova OV, Liu Y, Aasen GA, Mao K, Weltman NY, Nedich BL, et al. Thyroid hormone promotes remodeling of coronary resistance vessels. PLoS One 2011;6:e25054. Tomanek RJ, Barlow PA, Connell PM, Chen Y, Torry RJ. Effects of hypothyroidism and hypertension on myocardial perfusion and vascularity in rabbits. Am J Physiol 1993;265:H1638-44. Lei L, Zhou R, Zheng W, Christensen LP, Weiss RM, Tomanek RJ. Bradycardia induces angiogenesis, increases coronary reserve, and preserves function of the postinfarcted heart. Circulation 2004;110:796-802. Rodríguez-Gómez I, Banegas I, Wangensteen R, Quesada A, Jiménez R, Gómez-Morales M, et al. Influence of thyroid state on cardiac and renal capillary density and glomerular morphology in rats. J Endocrinol 2013;216:43-51. Smith TJ, Murata Y, Horwitz AL, Philipson L, Refetoff S. Regulation of glycosaminoglycan synthesis by thyroid hormone in vitro. J Clin Invest 1982;70:1066-73. Salazar JJ, Ramírez AI, de Hoz R, Rojas B, Ruiz E, Tejerina T, et al. Alterations in the choroid in hypercholesterolemic rabbits: Reversibility after normalization of cholesterol levels. Exp Eye Res 2007;84:412-22.